Promotional artwork released alongside the update. 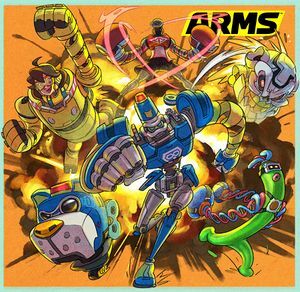 Version 5.4.0 was an update released for ARMS on 2018-09-19. Its most notable addition was compatibility with the Nintendo Switch Online service, adding voice chat to the game's online modes. In addition, a number of balance changes were made in the update. Smartphone app “Nintendo Switch Online” now supported. If matched with someone in online play, you can automatically match with them on the app as well to engage in voice chat. Party Match, Ranked Match, Friends, and Party Crash are supported. Video Playback from the Dashboard is now smoother. The following ARMS have been adjusted. ▲ Increased speed of charge attacks. Triblast ▼ Decreased speed of charge attacks. ▲ Widened area of effect of charge attacks. ▼ Increased time from drop to retrieval. Cracker ▲ Widened area of effect of charge attacks. Boomerang ▼ Decreased speed when thrown with an outside curve. ▲ Increased extension speed of throw attacks. Coolerang ▼ Decreased speed when thrown with an outside curve. Ramram Increased flotation for jump attacks. Thunderbird ▲ Increased extension speed of throw attacks. Megawatt ▲ Increased expansion rate for charge attacks. ▲ Decreased time from drop to retrieval. Seekie ▲ Decreased time from drop to retrieval. Slamamander ▼ Decreased retraction speed. Kablammer ▲ Increased retraction speed. Parasol ▲ Increased extension speed of throw attacks. Increased flotation for jump attacks. Parabola ▲ Increased extension speed of throw attacks. Ice Dragon ▼ Changing the angle when firing the laser is now slower. Glusher ▲ Increased speed of charge attacks. ▲ Increased expansion rate for charge attacks. Adjusted pathing for rush attacks. Funchuk ▼ Decreased speed of charge attacks. ▲ Increased speed of jump attacks. Brrchuck [sic] ▼ Decreased speed of charge attacks. ▲ Increased curving for jump attacks. Scorpio ▼ Reduced extension speed. ▲ Increased time from drop to retrieval. Lokjaw ▲ Increased curving for projectiles launched from charge attacks. Guardian ▲ Increased expansion rate while extending. Clapback ▲ Increased expansion rate while extending. ▲ Decreased time necessary to fire a rush attack. This page was last edited on 4 April 2019, at 07:41.